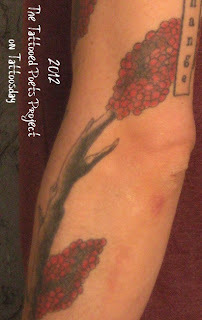 Today's tattooed poet, Fred Schmalz, resides in Germany, a first for the Tattooed Poets Project. 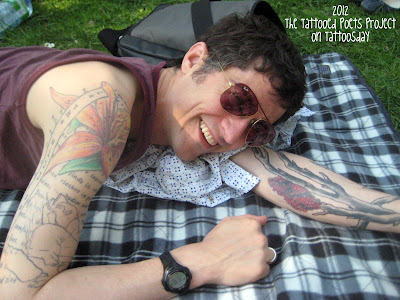 As you can see, he is also heavily-tattooed and, lucky for us, he sent us a lot of photos, so let's not waste any more time and take a look at his ink. 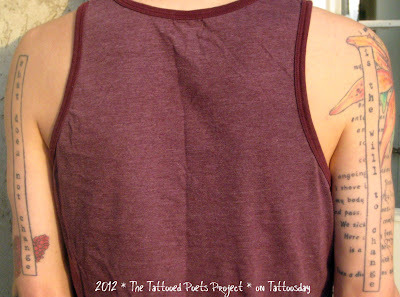 "...a right arm upper half-sleeve related to a poem of mine ('I am here to tell you where I slept last night') which originally appeared in 6x6 - containing a lily with a naked lady petal, a sleeping figure, and a text excerpt from the poem. 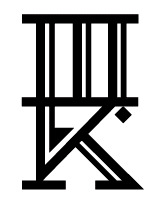 This is intersected by half of a two-arm text strip (down the backs of both upper arms) with the first line of Charles Olson's The Kingfishers - What does not change / is the will to change. 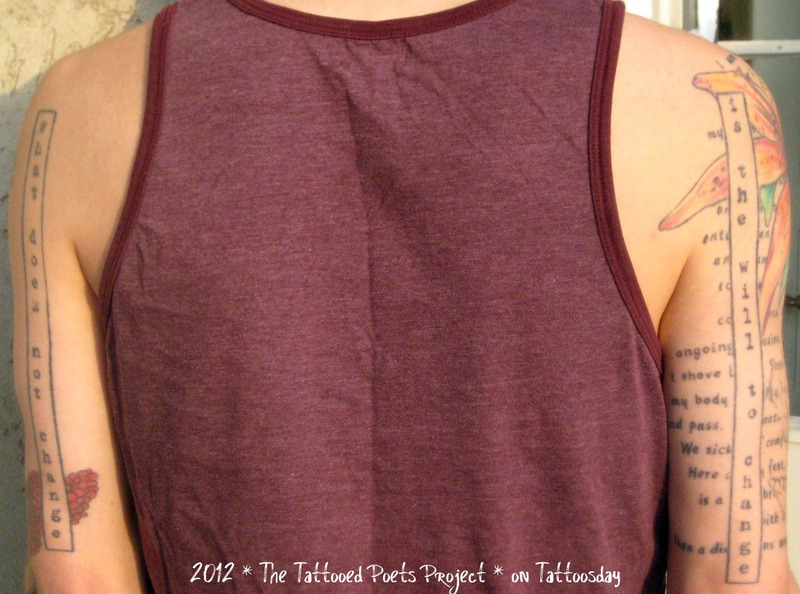 (the / which appears in the poem sits on the back of my neck). and several staghorn sumac branches with fruit. All except the three fish were inked by Stephanie Tamez at Saved Tattoo in Brooklyn." The following poem from Fred appeared originally in 6x6 issue 14 from Ugly Duckling Presse. gave me the bed below our bed. Mat inflated with lung air. Smoke screen for privacy. Privy. A thin door and three thin walls. The bed hidden below our bed is our last bed. Bed deemed worthy of our backs. Bed along with the rest of our loneliness. Bed born of necessary grammar. Bed requested by a shirtless man. one leg’s shudder before passing out. Blue vial in the sink. What will my body do? Tornado, be quick and pass. but not their natural environment. the new route home, resting as relatives. clean living, moon creeping into a skylight. loosen like rain clouds over mountains. and thus lack chemicals to warn me of fatherhood. No hemorrhaging in the spoils of joints. But I find that I am unusually hungry. my skin, heat radiation, radiance. idea derailed on the stretch to dinner. The coarse fabric you knit drops stitches. sufficing since neither of us is long. in my fever. They hold the sheet. The room we’re offered is a fuckless marble hull. if I break up the furniture. The refrigerator does not work. already it has been rolled up. We are alive with our calcium deposits. rules loosen: run in snow and melt our feet. blue in a tall shank of light. And the vinegar waft of the staircase. here are my feet, ashen relics. attaches to every object in the house. Our curtains haven’t kept the ocean out. We are the peninsula’s only hum. Fred Schmalz's first collection, Some Animals, is forthcoming in 2014 from Jackleg Press. His work has appeared in A Public Space, 1111, Zoland Poetry, LUNGFULL!, Spinning Jenny, Conduit, jubilat, Handsome, The Blue Letter, We are so happy to know something and The Bedazzler from Wave Books. His poems were included in La Familia Americana, a bilingual anthology of new American poets published in Spain by Cosmopoetica in 2010. An exhibition of contemporary German illustrators responding to his poems will be staged at Rotopol Press in 2012. He is founding editor of swerve magazine. 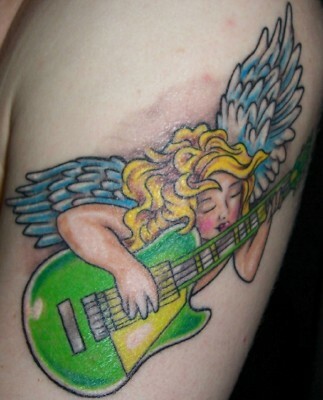 He lives in Kassel, Germany. Thanks to Fred for sharing his awesome tattoos and poetry with us here on Tattoosday's Tattooed Poets Project!